The Combat Life Saver (CLS) Folding Knife (model no. 22-41870) is the follow-up to Gerber's Hinder Rescue knife, also designed by firefighter-turned-knife-maker Rick Hinderer. 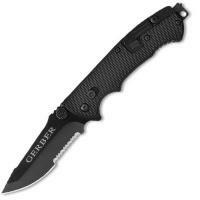 The CLS is a multi-functional stainless steel tactical knife featuring a non-reflective black finish. The 3.5 inch blade is partially serrated with a sharpened tip. Over-sized thumb studs allow the blade to be deployed with a single hand, while the liner lock safeguards users from accidental injury. The handle includes curved finger grooves for a comfortable grip and secure hold. The CLS incorporates additional survivor tools such as a built-in seat belt cutter, a window punch point and an oxygen tank wrench, creating the ultimate utility knife for rescue and military personal. A pocket clip and lanyard hole allow for convenient carry options.